The economies of the world are at an inflection point. Enough data points have now presented themselves to be able to see the outlines of a major shift in the markets of the world. We are at a pay attention moment. There comes a time when a successful investor must make some hard decisions to position himself to be able to take advantage of opportunities down the road. The markets are telling us now is such a moment. It’s time to sit up and pay attention to what Mr. Market is trying to tell us. It appears we are at the top of the cycle, anecdotal evidence is now pouring in. But that is just a cyclical story. The bigger story is that major market forces that have been brewing in the system for 25-40 years are now coming to a head. They are now dovetailing with the cyclical turn and together they may cause a massive shift in the world’s economic structure which has been erected over these 25-40 years. Few can even imagine these changes let alone prepare themselves for them. The main driver of this process is China’s bubble economy. If it bursts, the world goes into a depression. I am going to ask you to keep an open mind about this issue. Phrases like bursting bubbles, and world depression, likely sound like hyperbole, simply too far out there to really get serious about. No, its a real possibility and you need to consider it as such. In fact, the US and China have now been in a trade “Cold War” for 18 years now, since China entered into the WTO. But here is the thing…the USA hasn’t realized this until just recently. What is going on right now is the trade-cold war just broke out into a trade-hot war and the U.S. finally realizes it is one of the main combatants. The two sides are so far apart that there is no mutually agreeable solution. Both sides have launched the first round of weapons at each other (tariffs) and their effect has the potential to burst each others credit bubbles. I highly recommend reading the book Death by China by Peter Navarro. Peter is Trump’s lead trade advisor. Trump is executing Peter’s strategy. If you don’t have the time to read the book you can watch the documentary for free if you have 70 min of spare time. Again if you want to sit up and pay attention, you will do it, make it your weekends education. 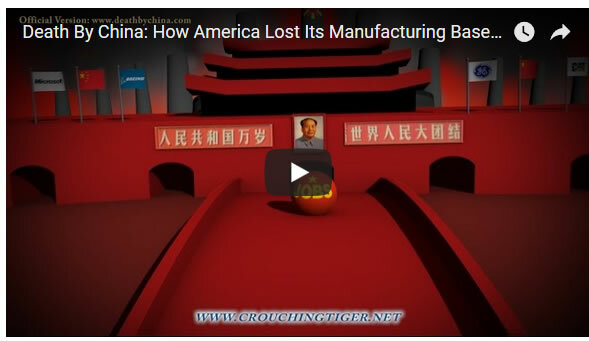 This documentary delivers the message of how the US has been gutted of its manufacturing base. You may not have realized how complete it has been, watch it and you will know the extent of it. This documentary provides a good understanding of what has happened, however what is more important for investors to know is how it happened from a macroeconomic understanding. Once you understand the macro story you begin to see that any attempt to resolve it leads directly to the bursting the bubbles on both sides of the Pacific. Yes, this is how unstable the world economy has become. The China Story in condensed bullet point form. It would take a book to properly explain how all of this happened, but I am going to try my best to the weave the story into condensed form. The huge bubble on both sides of the Pacific was enabled by the ending of the Bretton Woods monetary system. This was because since dollars could no longer be exchanged into gold, huge imbalances could now be accumulated and held as the result of trade surpluses. 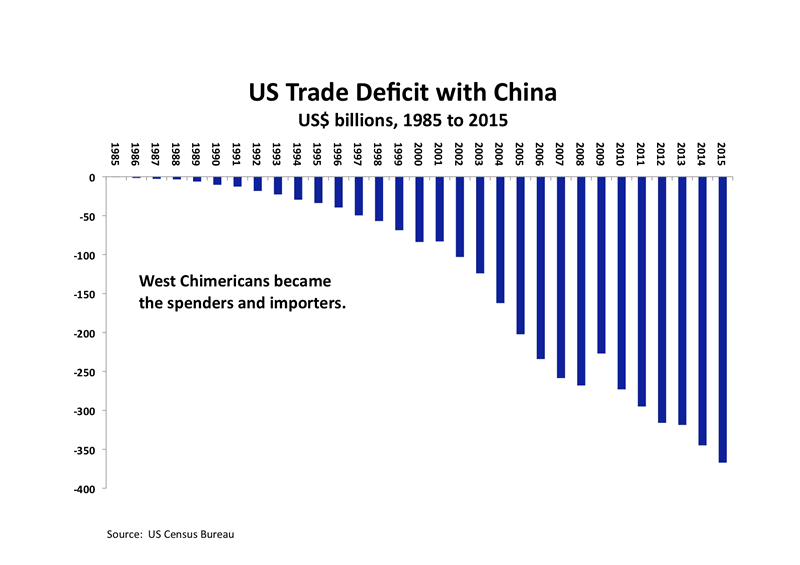 As the Chinese accumulated massive trade surpluses they bought US Treasury debt and held it on their balance sheet. This had many effects: first off by purchasing $4T in US Treasury debt with their trade surpluses it stoked the financial bubble in the USA. Secondly the Chinese printed Yuan and bought US Treasuries which was a form of currency manipulation. 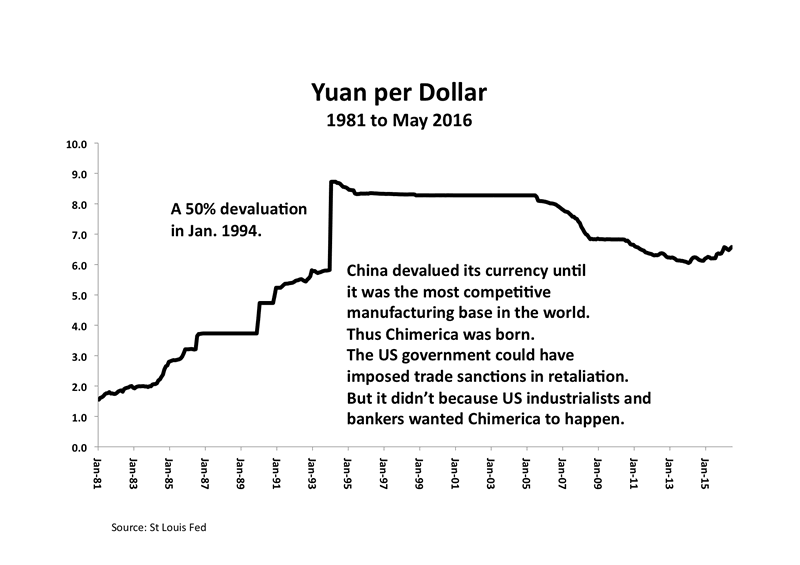 It kept the Yuan from rising thus keeping their goods competitive. Otherwise running such huge trade surpluses would have made their currency rise and prevented them from being able to sell cheap goods. So where did China get all of its money from? In a word it came from a fractional reserve banking system. China received $4 T of foreign capital inflows and they used it as base money to loan off of. They created over $25 T of credit collateralized by the $4 T of foreign inflows. Essentially money out of thin air. You should now start to see why a trade war is an impossibility for China, If foreign inflows reduce it shrinks their highly leveraged and unstable credit bubble. The nature of credit bubbles is they must keep expanding. The second it shrinks the entire structure has the risk of unraveling. This is why the dance between the US and China is a high wire act. Through massive credit creation China has built out its export industry to where they now produce 59% of the world’s cement production, and 50% of world steel production. The world now only needs 65% of this capacity therefore a steel tariff on Chinese steel could result in China holding 35% of world steel production as idled capacity. This would blow a hole through the Chinese economy. The average daily wage of Chinese workers is $9/day so there is insufficient domestic demand to sustain these industries. Bottom line: to survive China must export its extreme excess capacity in the face of lack of world demand. This is an unsustainable model which has now run out of time. China is now set-up for a hard landing and when China has a hard landing the world goes into a depression because since 2008 it has been their growth that has driven the world. So the Chinese are already out of bullets, they cannot match the tariffs thrown up by the US since their exports are 4X greater than the US and they only import $130 B. Understanding the nature of the Chinese model which they have built out over the past 30 years one can see they cannot possibly comply with any of the US demands because they must maintain a trade surplus. Without this surplus their economy implodes. What Trump trade policy is attempting to do is to reverse the 35 year structural configuration of the world economy without triggering a collapse. The key element of this structure is the ongoing trade deficit between China and the world. The seemingly impossible task is to eliminate the trade deficit without popping the bubble. Government propaganda would have one think that our current recovery is an organic growth story and the US engine is pulling the world out of the 2008 GFC. This of course is delusion as the truth is that since the 2008 GFC China has been the driver of world economic growth. This growth has been fueled by rapid credit growth within China. Ending growth in China would be the catalyst for the world slipping into a depression with massive idled capacity to reconcile. So with a hot trade war breaking out its easy to see that if this gets out of hand it could have immediate and dire consequences for all the world’s economies. All of this of course is custom designed as the ingredients to the post bubble contraction which it appears we are now entering into. Question: What happens to the senior currency during a PBC? Answer:- Simple, it goes up. Because credit contracts and debts must be paid off in the senior currency. Also money from around the world flows towards the senior currency and the most liquid financial instruments in that currency: short term treasury paper. The Gathering Storm- Data Points start to coalesce. We should all know our current market is only months away from being the longest bull market in US History if we go on to new highs. Also the current economic expansion is just months short of being the longest in US history. Yes, the cycle is very long in the tooth. Therefore we should be on the look out for ending action and there is plenty out there. You have heard a lot about this. 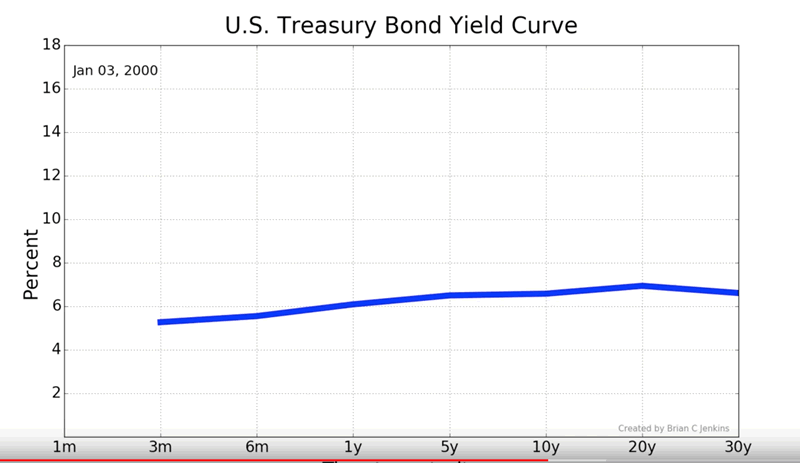 Contrary to what you may have heard it doesn’t have to invert to trigger a recession plus the current curve is just as flat as when the last two market peaks occurred. I have chronicled before the sequence of events we have been witnessing as the market stepped through the topping process of the past year. Throwover top, buyers capitulation, bitcoin as the the main object of speculation at the top, and once the top was in the immediate the slaughter of the volatility traders. 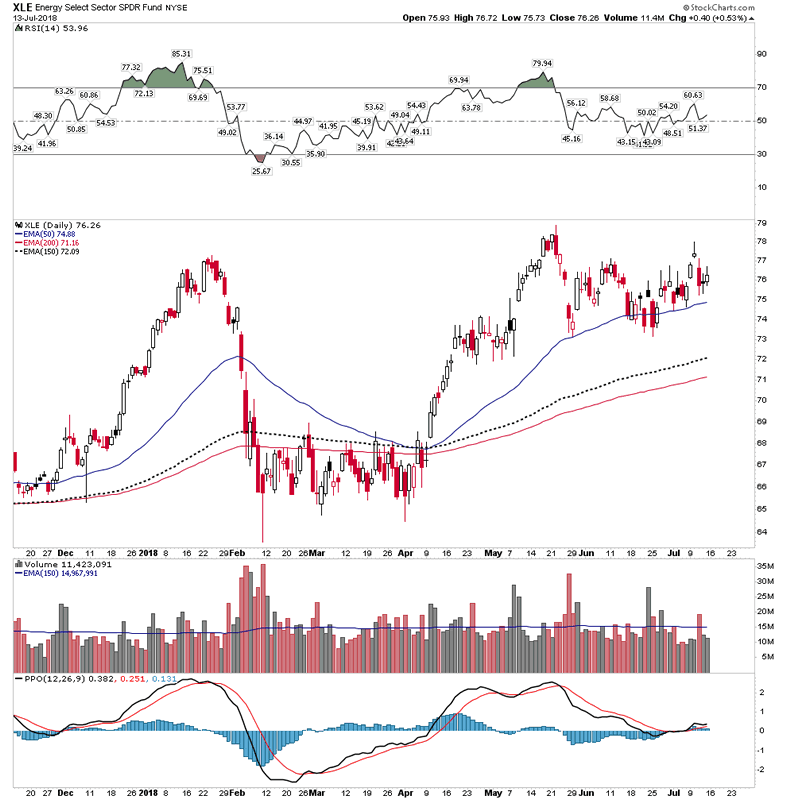 Since then the market has been going through the motions of a Dow Theory confirmation process while the market has put in divergences of the NASDAQ and Russell going onto new highs. We have covered this before, but now we have new elements of a topping process which have surfaced recently, principally in the commodity sector. Commodities have had a rough time over the past month and look to have put in its top as well. The above charts are pretty eye popping once one looks beneath the surface. Overall the commodities index shows a minor turndown, but that’s mainly due to the energy complex holding the overall index up. Keep in mind energy typically holds up until the last second. In 2008 oil reached its peak in early July well after everything had already begun to turn down. 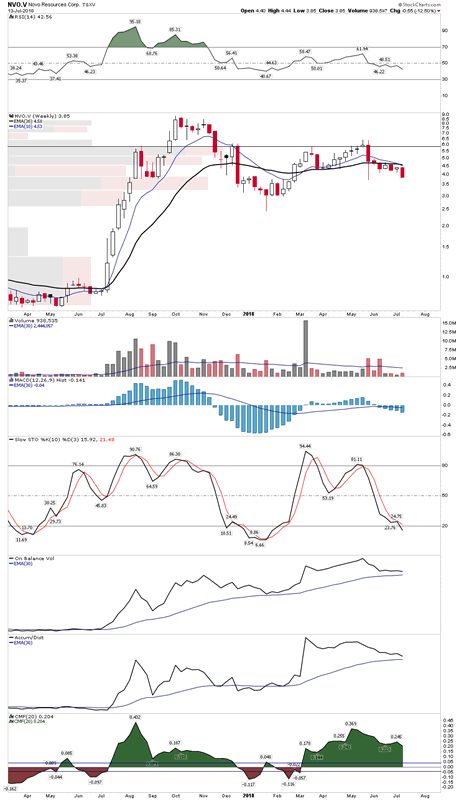 Industrial Metals– Broke with 30 EMA turned down. 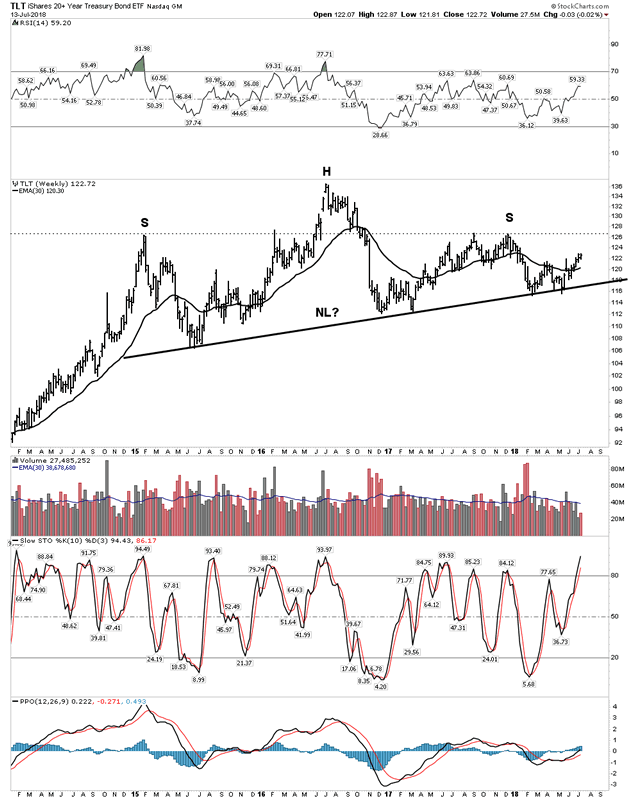 Energy/Oil – Still in an uptrend, however possibly putting in a top currently…see below. Commodities getting crushed is part and parcel of a PBC taking hold of the market. 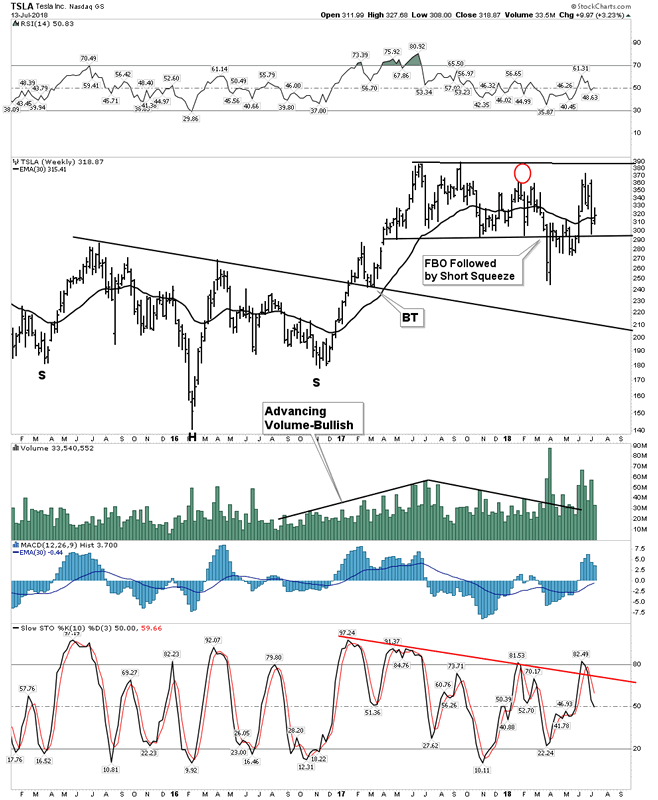 So above we see another major piece of the puzzle falling in place with commodities topping. A few weeks back it was the emerging markets and now the latest is commodities themselves. 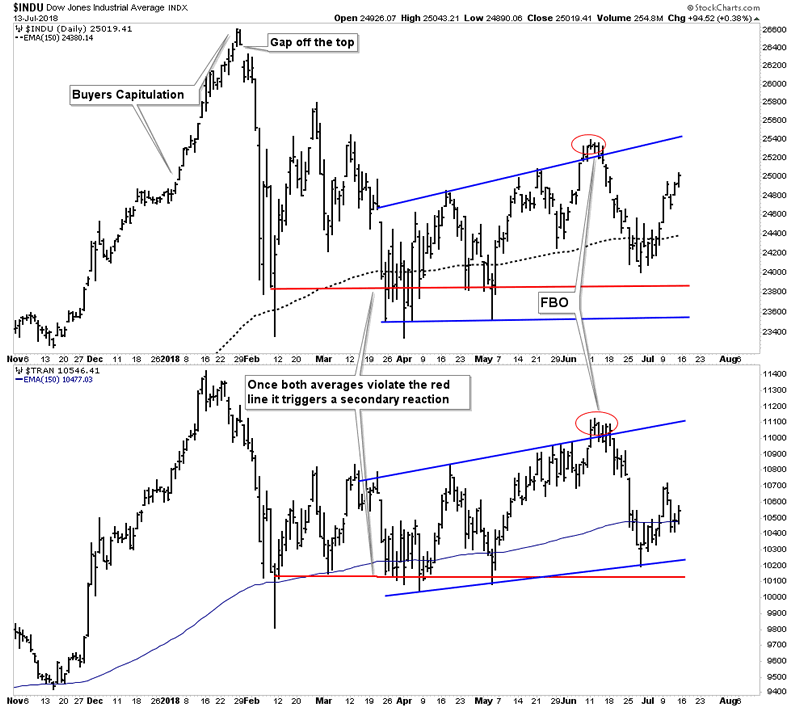 So why aren’t stocks themselves headed down? I suspect they are simply marching along on borrowed time. We are in peak summer La La Land. In my view the key tell to the market is Tesla. As long as Tesla can remain elevated it means psychology remains positive and risk on. Here is a stock that is so clearly a fraud yet, it continues to hover and brutalize the shorts. As long as investors chose not to see the obvious frauds that are out in plain site such as Tesla, it tells us the public desires to keep their blinders on and whistle past the graveyard. Recall what a glorious summer in Paris it was in July 1914, as people took in the sun and enjoyed themselves in the cafes throughout the city, oblivious to the forces of disaster coalescing throughout Europe. Could that be where we are today… metaphorically? Below we see the transports going the opposite direction as the DOW over the past three days. One thing is clear…copper is now in a bear market. It spent the past year putting in a flat distribution top with momentum waning the whole time. When it finally finished the job of passing the bag to those staying too long at the party, it let go with with no uncertainly. This is the type of signal that one must pay attention to…it’s meaningful. 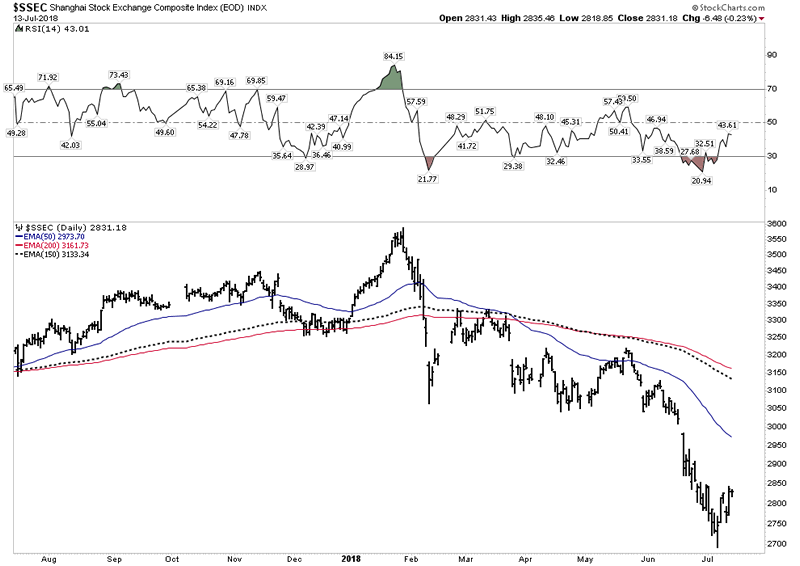 The Shanghai exchange is now set-up for a recovery bounce as it has put in a DeMark 13 exhaustion low. But it comes off of a V-bottom, I wouldn’t go near this market. 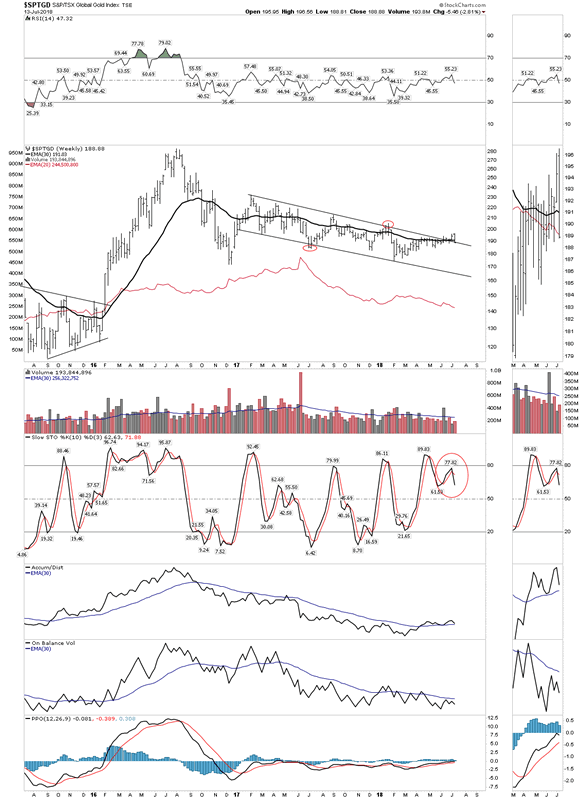 The copper signal taken in context with the Shanghai chart indicates that the problem is coming out of China. After a breakdown signal from copper we could expect bonds to follow and that’s what seems to be setting up. 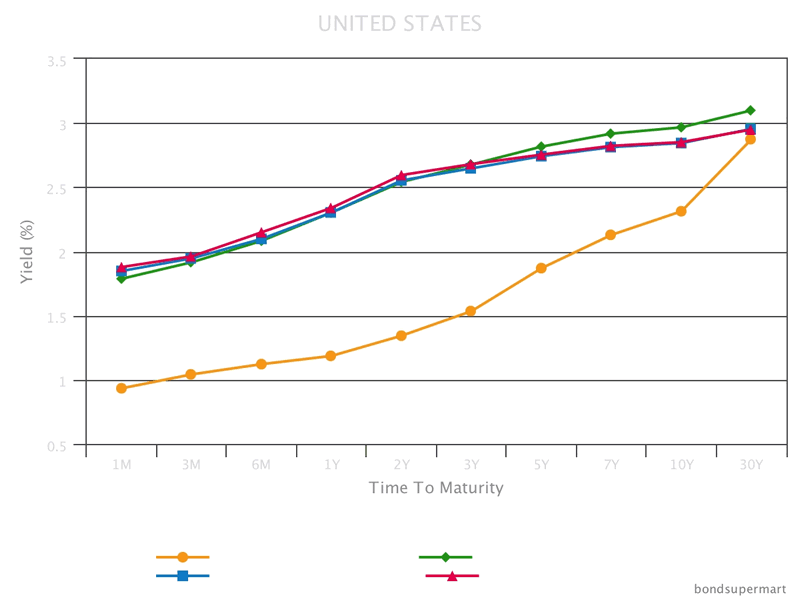 Rambus has pointed out how the bond market looks ready for yields to put in a top. 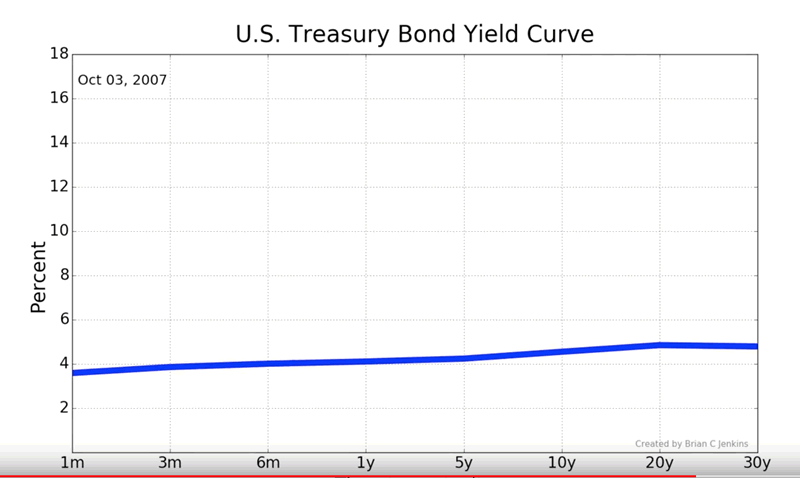 This is of course what Lacy Hunt has made clear for sometime that yields will not stay at these levels with an economic downturn in a PBC. 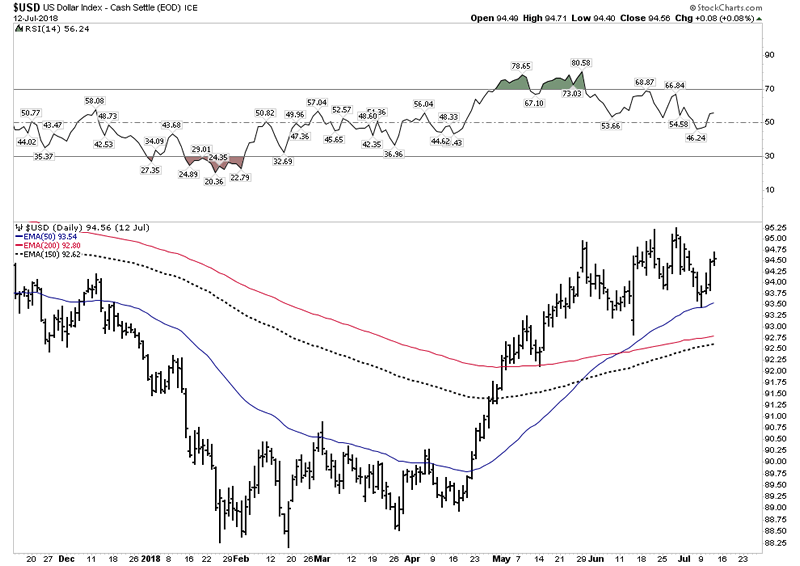 The XLE is still near its highs, however momentum has been waning and is in a position where a top could be put in. 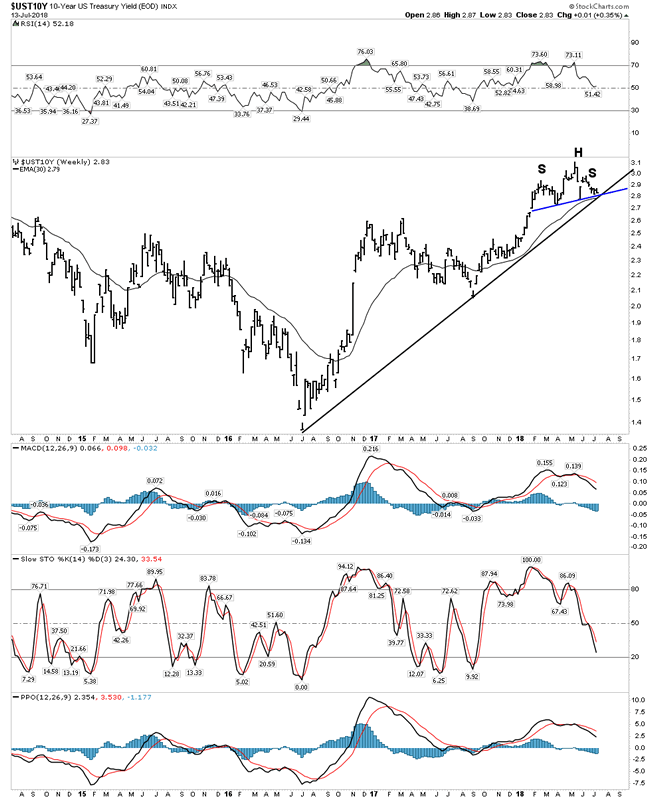 Weekly XLE in an uptrend with waning momentum: RSI, MACD, PPO nearing crossover…Could it be last call? Daily: Note the last two candlesticks putting in shooting star tops. 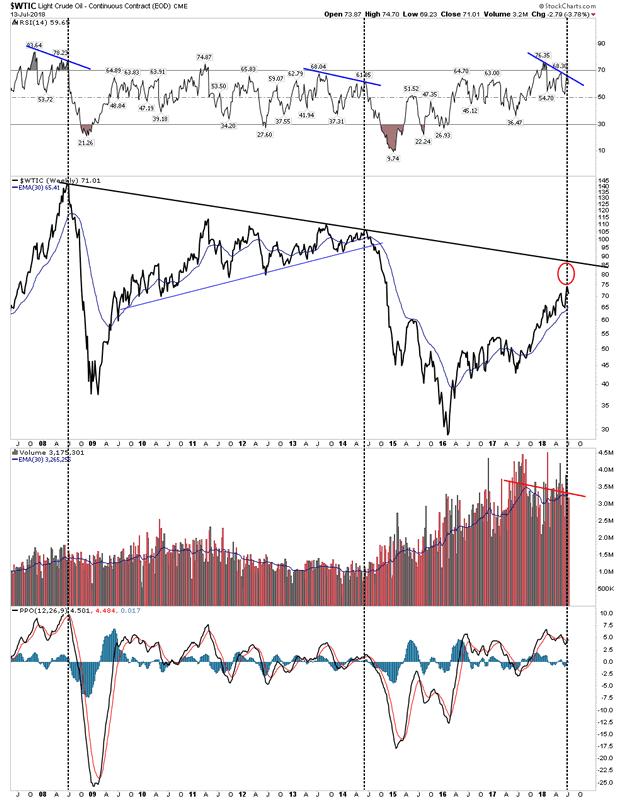 OIL- Could the oil price be setting up for a cyclical top? 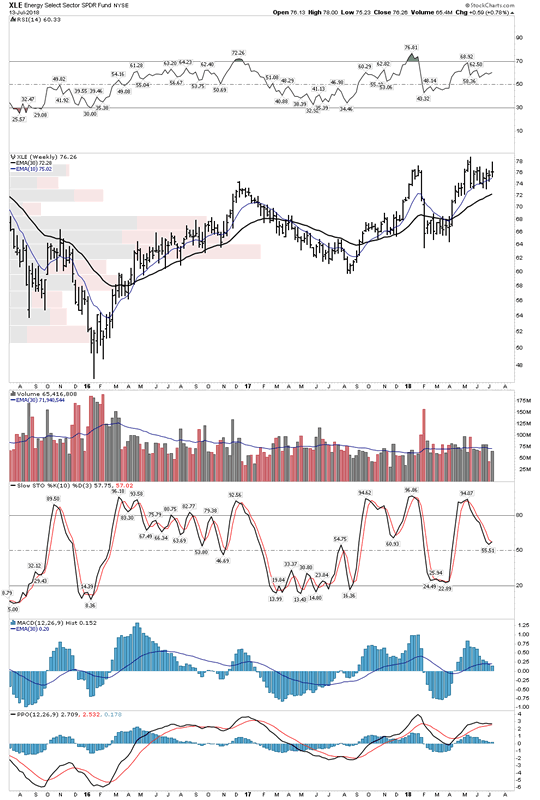 RSI indicates failing momentum… Volume unable to make a new high. The script for a PBC is for the gold and silver stocks to initially get hammered since they are still stocks and for gold to dip initially. Gold serves as a liquidity bank so it gets tapped when markets get sold. But it is also the first to bottom then start an uptrend that develops into a bull market. That’s the script I am following so I raised a lot of cash this week and plan on waiting until the fall to deploy it. 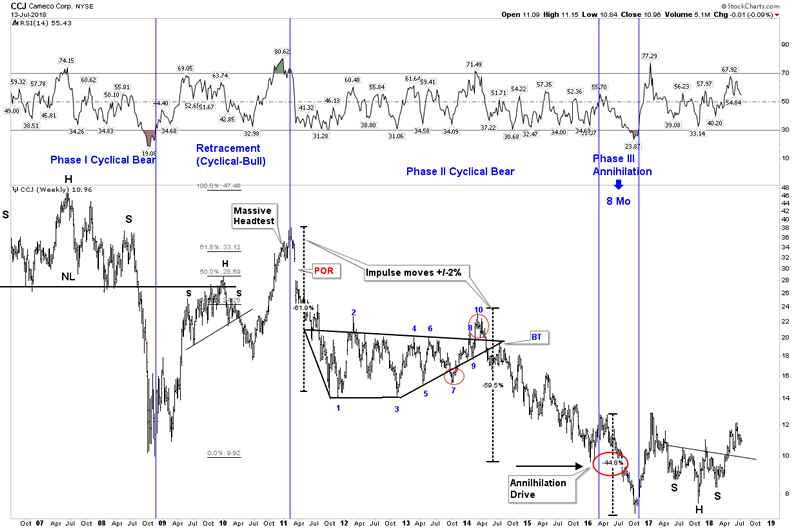 Rambus has stated that the last 2 years in the gold market was just a consolidation in an ongoing secular bear market. I am not willing to cede this, however within the context of the Jan 2016 lows we are likely headed for a hard shakeout over the next 3 months. Novo has a problem. It has a huge market cap valuation with nothing yet proven. Not saying the gold is not there, but the company has not yet proven anything after one year. I think the market is losing patience and appears ready to breakdown. Novo’s communication strategy has failed. Could the triangle below be a halfway pattern? If so a sub $3 price seems imminent. 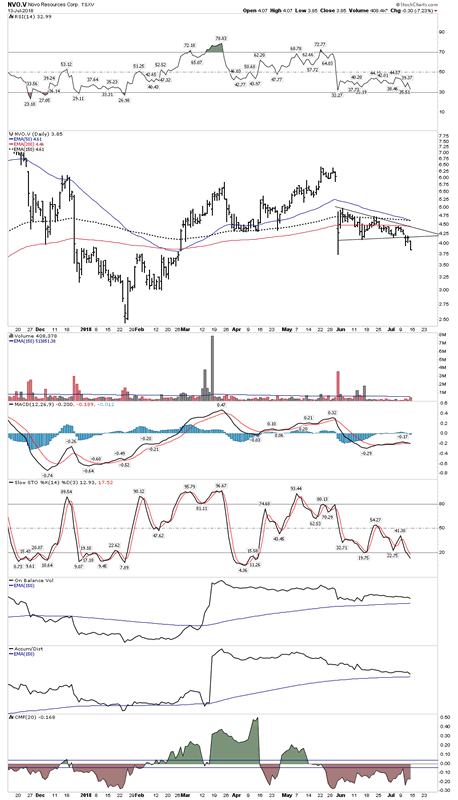 This is about the only sector I still feel good about as it remains undervalued, oversold and in an uptrend. It is still coming off of its bottom, but positive fundamentals are fast catching up with this group. Utilities are going to have to start buying long term contracts within one year. 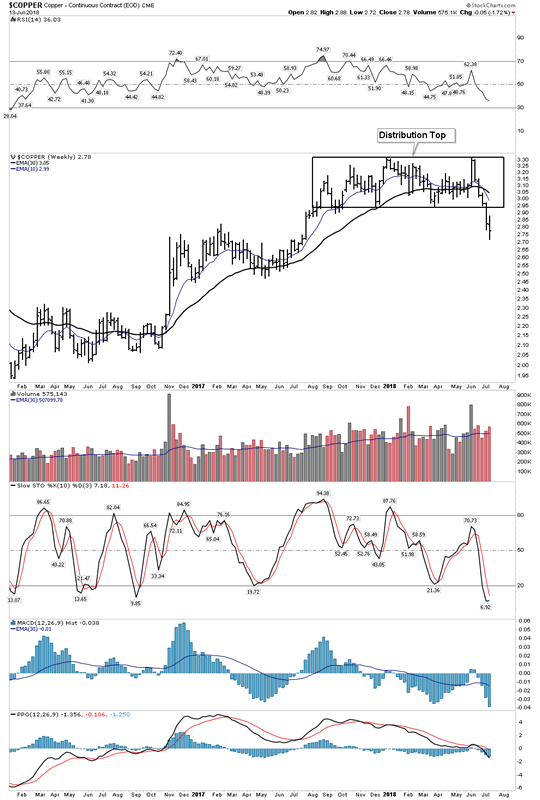 Commodities are in a down trend and even possibly in a bear market, but I am holding onto my uranium positions. Once the string gets pulled tight on supply one wont be able to get into this sector at anywhere near today’s prices… it will be instant. I will be at the Sprott conference next week. Anyone else attending drop me a line.